Over the years, I’ve researched many forms of skin care and that includes some more intrusive techniques such as laser treatments. And while I’ve always leaned more towards the “organic” way, some of my friends have tried laser and they’re brutally happy with the results. However, not everyone feels ready for it mostly because of lack of knowledge about how the proccess actually is. 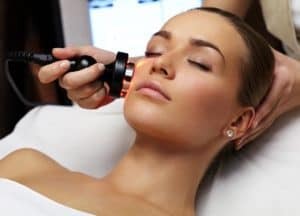 In this article, I’m going to give you a quick rundown of how laser skin treatments for skin tightening work, so you can decide whether or not they’re the right thing for your particular situation. Surgery is a popular way to reduce the appearance of severely sagging skin. But what happens if the sags and wrinkles are not severe enough to warrant surgery? Laser treatment is one potential answer to that question. 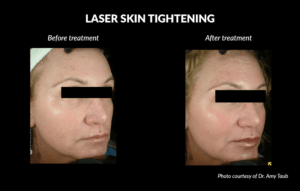 There are several reasons lasers work so well for skin tightening. One reason lasers are influential for skin tightening is that they influence existing substances within the body. Namely, a laser beam designed to tighten the skin causes cells to heat up, drawing existing collagen molecules closer together. As the collagen between the skin cells is drawn closer together, so are the cells themselves, causing a tighter appearance to the skin’s surface. That process can negate some of the natural collagen separation which occurs due to the aging process, as well as additional cell degradation caused by other influences. Another benefit of laser skin tightening is that the minor cellular harm the laser causes can make the body produce additional collagen. That is one of the major reasons skincare industry scientists and experts have used-lasers to treat sagging skin for many years. The additional collagen can make the skin stronger, slowing down the development of new wrinkles and sags as well. Also, the triggering of additional collagen production causes widespread healing of minor skin issues. Although surgery is required to treat some skin problems, many can be treated with lasers if they are caught early enough. If your skin can be treated with lasers instead of surgery you should choose laser treatment if your choices are narrowed down to those two options. There are multiple reasons you should make that choice. For example, laser procedures do not require long hospital stays or sedation risks. The cost of laser treatment is also likely to be far less than the cost of surgery. Though it is important to factor the need for multiple laser treatments into your budget calculations. Leading up to your skin tightening appointment you should avoid the sun as much as possible for about two weeks. The reason is that a sun tan or sunburn can make your skin extra sensitive and prone to burns during treatment. It is also important for you to avoid tanning of any kind, including the application of a spray tan. Additionally, your skin needs to be completely devoid of foreign substances in the treatment area. That means you cannot use deodorant, perfume, or lotion on the area to be treated on the day of your laser skin tightening procedure. When you attend your laser treatment the technician will start by sterilizing your skin. He or she will then use a cream or lotion approved for use with lasers to cause the skin to become numb. As the laser device is passed over the treatment area the technician will also use cool air to help to keep your skin as comfortable as it can be during the process. When the procedure is over the technician will give you aftercare instructions which you must follow as well. Since laser skin tightening triggers responses within the body, the time it takes for results to show will depend on how quickly your body starts to heal itself. You are not likely to see any changes at all right away. It can take a couple of weeks for your skin health to improve a bit, and even when it does the improvement may be slight at first. However, additional laser treatments may amplify the improvements that you see. I suggest you use skin firming creams as a part of a consistent beauty routine to see lasting results.